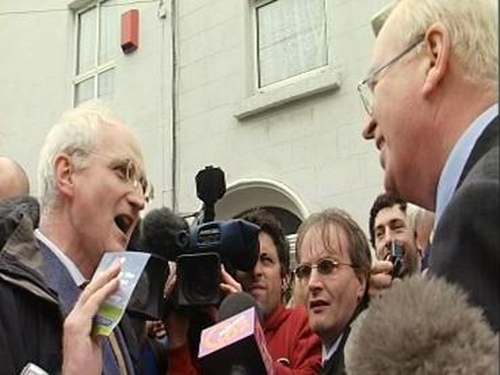 An afternoon press briefing by Tánaiste Michael McDowell was interrupted by Green Party chairman and Dublin South-East opponent John Gormley on the streets of Ranelagh, Dublin. Mr Gormley wanted Mr McDowell to denounce a Progressive Democrats pamphlet which the Green candidate claims is false. RTÉ reporter Donagh Diamond fact checked that pamphlet for a recent edition of Prime Time and found that there are a number of misleading claims made by the PDs (watch that report here). Mr McDowell was unveiling a poster saying 'Left Wing Government? No Thanks' in Ranelagh, the site of his famous telegraph pole climb in the last election. RTÉ political correspondent David McCullagh, who was covering the McDowell press briefing, says Mr Mc Dowell advised Mr Gormley to 'calm down' while other PD members told him to go away, but Mr Gormley replied it is you who is finished. Just as the rumble was about to finish, Dublin South-East candidate Lucinda Creighton of Fine Gael arrived to put up a poster of her own.